From LomaxandBriggs.com ~ Barry Gerber, one of the most hated men in Hollywood, is a no show for a red carpet event. The next morning he turns up dead, killed in such a bizarre way that neither Detective Mike Lomax nor Terry Biggs nor anyone in Forensics has ever seen anything like it before. Two days later, the prime suspect – another despised Show-business Bad Boy – is found murdered in the same sadistic manner. The list of suspects is as long as the credits in a summer blockbuster. Everyone hated the murdered men. Terry Biggs jokes that this could be an elaborate public service effort to make Hollywood a better place to live and work. But he and Lomax soon find that all jokes are off as they wade through a daunting number of leads to uncover who will be the next victim. What they stumble upon is a motive far more primal than they had ever imagined. This is the second in the series of three (I read #3 first, then #1). I like mysteries and I enjoy Karp's comical writing style. I didn't get a chance to figure out "whodunnit" because we find out about halfway ... but it's interesting to see the twists and turns before the end. Definitely a series I'd recommend. Amanda, Angie, Jen and Pat and I have gone away for the weekend for the last celebration of Angie's 40th birthday. We are staying at the Briars, about 90 minutes north of Toronto. Here's where we are staying. We usually come up every year in the winter so it's nice to see what it looks like in the summer. It's gorgeous! Jen and I did a cruise around the Point with Captain Brian. We liked it so much that we didn't get off the boat and we did it again! Angie gave us all gifts ... mine is a magnet that says "It's all about me". There is a DJ who spins the tunes every Saturday night in the dining room. He's about 100 years old! The dining room was really quiet tonight and the tunes were lame so we headed out of there early. There was a small beach just below us. I had thought about going swimming yesterday afternoon. The air and the water were warm. But I ended up sitting on the deck having a cocktail instead. Angie and Pat went swimming this morning. I was already packed and didn't feel like digging out my bathing suit, showering afterwards, etc. Despite the grey sky, they said the water was nice. Amanda didn't feel like going in either. From LomaxandBiggs.com ~ Welcome to Lamaar Studios. Once a small Southern California animation house, it has grown into an entertainment conglomerate encompassing movies, television, music, video games, and a sprawling theme park called Familyland. When an actor portraying Familyland's beloved mascot, Rambunctious Rabbit, is brutally murdered on park grounds, Lamaar executives fear that their idyllic image of '50s America will be shattered. Feeling pressure from the studio, LAPD Detectives Mike Lomax and Terry Biggs must conduct their investigation while avoiding the public eye. But as more murders are committed, Lomax and Biggs uncover a sinister plot. Someone has a vendetta against Lamaar, a vendetta worth killing for. With the media closing in and political pressure mounting, the partners must race to discover the Lamaar-hating madman before he brings the family entertainment giant to its knees. After reading and enjoying Karp's third book in the Lomax and Biggs series a couple weeks ago, I wanted to read the first two (this is the first one). It's quite long (632 pages) but good ... I didn't find it dragged. Interesting twists along the way and I didn't figure out who dunnit 'til the end when it was revealed. And it's not just a murder mystery ... you meet Mike Lomax whose wife had died six months earlier and how he is getting on with his life. His wife left nine letters for him to open, one a month (similar to PS, Cecilia's Ahern's PS, I Love You). So if you are looking for a mystery with humour, you should check it out. I hosted a Single Horizons event today to Niagara Falls ... I had a busload of 55 people. We stopped at Magnotta Winery in Beamsville for a while for some wine testing. Then we were off to Niagara Falls. 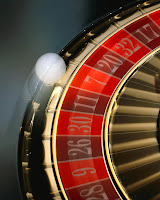 Gord and I played a bit of Roulette. Rather than playing the tables where there is a $15 per round minimum, we played on a machine that has a $2 per round minimum. I put $30 in the machine with the intent of playing 15 rounds and quitting. My number came up the first round so I won $72 right away! I played just a couple more rounds before cashing out at $90 ... I was happy with my $60 profit. Gord and I had a late lunch at Taco 'n Tequila. We've had drinks there in the past but this is the first time we've eaten there. We both had chicken chimichangas ... there were delicious! Chia Kitty enjoyed a Corona. Here's Gord as we were leaving. Then we walked to the Falls. Here's the Canadian side. Chia Kitty had a good view. Here are Gord and Chia Kitty. As we were walking, this little girl ran past us crying, obviously lost. It was great the way that people stopped to help her. Here they are handing her over to a cop. We got closer to the Falls. There's the Maid of the Mist. We took the incline train back to the casino to catch the bus home. We got a lot of rain the last couple of days. No doubt my plants were loving it! It was sunny and warm today ... no doubt my plants loved that too! As you know, Gord loves beer! So before we went to The Proposal, we stopped at Great Lakes Brewery, which is just around the corner from the theatre. 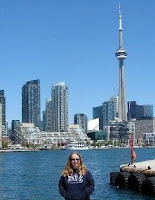 Founded in 1987, Great Lakes is Toronto’s oldest craft brewery. Their logo on the windows is fun! Their seasonal, Orange Peel Ale, is now available. Refreshing, zesty and unique, it’s best served with a fresh orange wedge. From Amazon.com ~ Hailed as the “MySpace” for professionals, LinkedIn has taken the Internet by storm. It is now estimated that 19 million business professionals log in to this site every day to look for job opportunities, search for potential clients, get recommendations from colleagues and reconnect with former coworkers. LinkedIn allows users to create a profile detailing their professional experience and accomplishments, which will help them connect with literally thousands of qualified professionals in their field. How to Succeed in Business Using LinkedIn takes users through every aspect of the site, from getting registered and building their network to posing questions and creating groups. I've been on LinkedIn for a few years but didn't appreciate it 'til I read Jason Alba's I'm on LinkedIn -- Now What??? last year. Eric and Kathy's book takes you step-by-step through everything and includes screenshots. If you want to learn more about LinkedIn and all it can do, this is a good book to check out. From Amazon ~ Fitness guru Michaels, a fitness and life coach who has appeared on NBC's The Biggest Loser, brings her tough-love style to the pages of her first offering. For those familiar with Loser, Michael's no-excuses approach here may seem less intimidating than it does to those meeting her on television. She writes with an edge, warning readers that they cannot make excuses, they will work hard and they will suffer setbacks, but they will also change their lives for the better. Her "3-S" (Self, Science and Sweat) plan covers the mental and physical, and Michaels dedicates equal sections of the book to each. In Self, she announces to readers that she was an "overweight and unhappy teenager" who took charge of her life, challenging readers to do the same. While no book has the power to change a person, the tips Michaels provides-create a support system, keep a journal, change your self-talk-do. In Science, Michaels dispels common diet myths (skipping meals is best, diet pills work), provides recipes for meals and snacks and introduces the concept of fast-, slow- and balanced-oxidizers, which determines a person's ideal diet. The final Sweat chapters include easy-to-follow exercises accompanied by photos, and a five-day-per-week, 12-week fitness program centered on burn-and-tone cardio training. The book and coaching come relatively cheap, but to follow the program without substitution exercises, readers will need access to a gym or a weight machine. And, unfortunately, Michaels does not make house calls. When Gord was getting ready for work this morning, he discovered Byron sleeping on the windowsill in the spare room. We call this "Byron's Window" because he love love loves it! He can usually be found sitting there keeping an eye on things. I recently got a message on Facebook from Sandra who I went to high school with (we graduated in 1980). She had been cleaning out a closet and found a picture ... and wondered if it was me coming down the stairs. 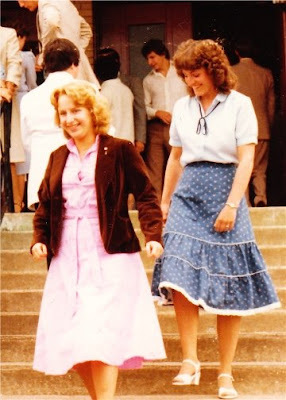 It was taken at her wedding in 1982 in Sydney, NS. She scanned it and emailed it to me this evening. And sure enough, it is me! 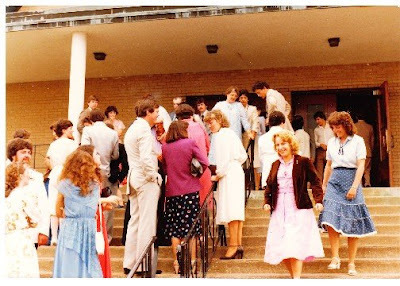 There I am in a pink dress and a brown velour jacket (yes, brown velour!) with my friend, Chrissy, behind me. Chrissy and I went to high school and university together. Lemme zoom it in for you so you can see how we stylin' we were! Man, do we look young! We would have been just 20. * The latest trends in online retail -- what retailers are doing right and what they're doing wrong -- and how nearly every Internet retailer from iTunes to Amazon can drastically improve how it serves its customers. * A guided tour of the most innovative stores, malls and retail environments around the world -- almost all of which are springing up in countries where prosperity is new. An enormous indoor ski slope attracts shoppers to a mall in Dubai; an uber luxurious Sao Paolo department store provides its customers with personal shoppers; a mall in South Africa has a wave pool for surfing. The new Why We Buy is an essential guide -- it offers advice on how to keep your changing customers and entice new and eager ones. 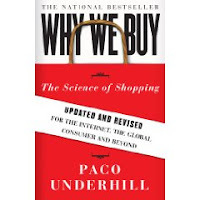 Interesting book to see why retailers do what they do to get us to buy. Here are my plants on the terrace this morning. I had put my houseplants (a spider plant and two shamrocks) outside last month when it was warm ... but then it got cold again and I had to take them back in again. The spider plant is still recovering. As is my chocolate mint plant. My pal, Yvette, moved into her condo last month. She had us over tonight to check it out. It's really cute. Her condo is on the 16th floor in Etobicoke and faces west. Here's Yvette on her balcony. And here we are ... Jenny, Yvette, me and Susan.